459, HUBCAP USED,15", 87-88, DODGE, CHRYSLER, LANCER, LEBARON, MACHINED, 5 SLOT TYPE WITH GRAY POCKETS, 5 FAKE CHROME LUG NUTS, METAL CLIPS..
495, Hubcaps used, 15", 94-95, CHRYSLER, PLYMOUTH, LE BARON, VOYAGER, 10 SLOT TYPE, STAINLESS WITH GRAY POCKETS, 5 GRAY FAKE LUG NUT CAPS & NO LOGO, 10 PLASTIC CLIPS & WIRE RING. 497, Used Hubcaps, 14", 94-95, PLYMOUTH, VOYAGER, 10 SLOT TYPE, MACHINED FACE, MEDIUM GREY POCKETS, 5 FAKE LUG CAPS, PLASTIC CLIPS, WIRE RING. 511, HUBCAP COPY SINGLE, 15", 96-00, DODGE, CARAVAN, SILVER, 5 SLOT, 5 CHROME FAKE LUG NUTS. 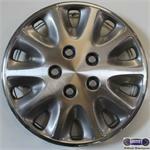 511, HUBCAP COPY, 15", 96-00, DODGE, CARAVAN, SILVER 5 SLOT. WITH 5 CHROME FAKE LUG NUTS. 5153b, CENTER CAP USED, 01-03, CHEVY, GMC, SPARKLE SILVER PLASTIC CAP, GOLD NOTCHES, ETCHED OUTLINED SILVER COLORED BOWTIE, 7" DIA. 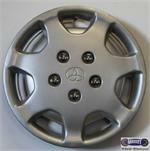 532, Hubcap used, 15", 98-00, Plymouth, Voyager, Chrysler, Town & Country. SPARKLE SILVER, 10 HOLES, 5 CHROME FAKE LUG NUTS, 10 PLASTIC CLIPS & WIRE RING. 548b, HUBCAP USED, 15", 01-03, DODGE, STRAUS, 7 SPOKE, SILVER INLAY, W/O CHROME CUTOUT, ETCHED RAMS HEAD, 5 FAKE CHROME LUG NUT COVERS, 5 ROUND HOLES BETWEEN LUG NUTS, 7 SETS OF PLASTIC CLIPS, WIRE RING. 6522c, CENTER CAP USED, 96-98, PONTIAC, GRAND AM, NO LOGO, 5 BLACK FAKE SCREW ON LUG NUTS, SILVER. 6-1/4" DIA. 6547a, CENTER CAP USED, 01-05, PONT, GRAND AM, SPARKLE SILVER WITH 5 BLACK FAKE LUG NUTS. BLACK CENTER WITH RED LOGO. NOT ROUND STAR DESIGN. 7016, CENTER CAP USED, 00-02, SATURN L SERIES, MACHINED, 5 FAKE BLACK LUG NUT CAPS, 5 FILLED HOLES, HELD ON BY LUG NUT CAPS, 9-3/4" DIA.